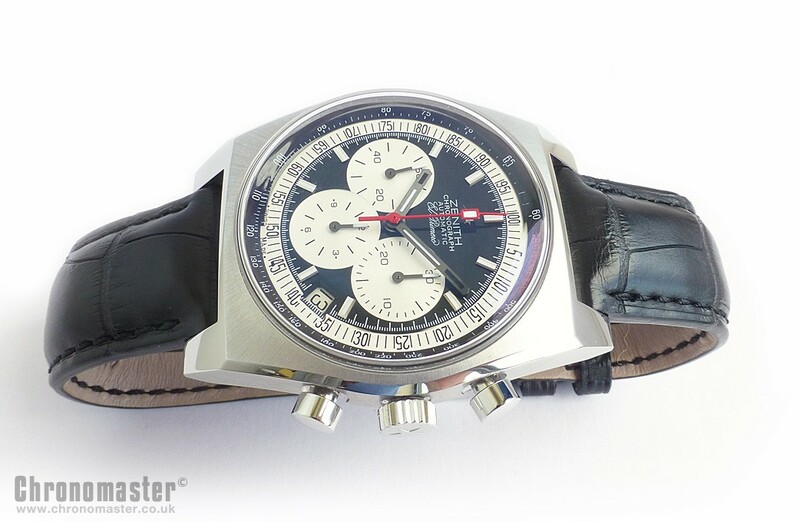 Used but mint and new looking condition Zenith El Primero vintage 1969 automatic chronograph. 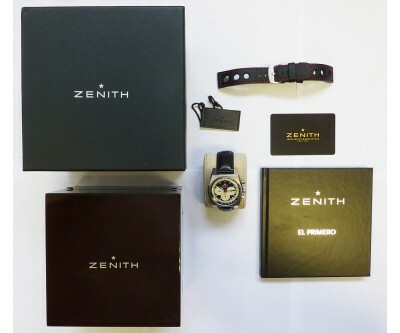 It comes with the box and paperwork with unstamped warranty card and spare generic strap. 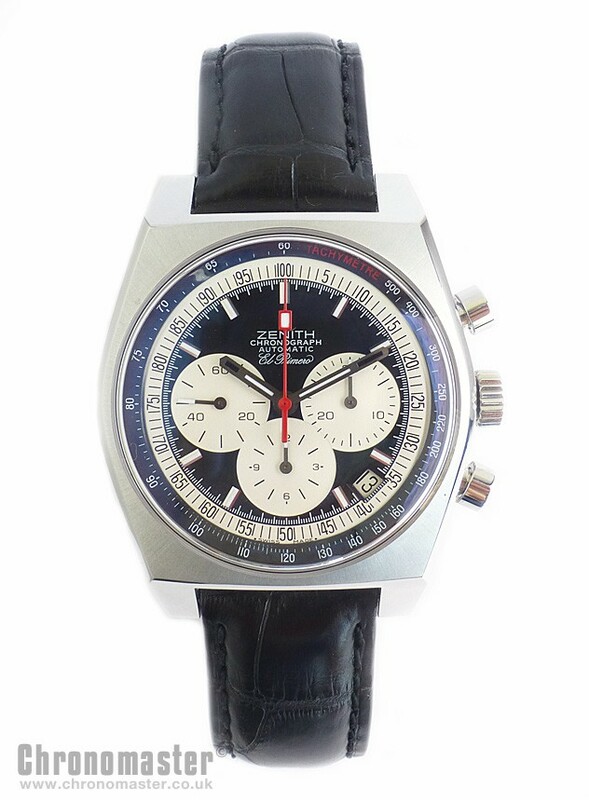 This is a modern reproduction of one of Zenith’s classic models from 1969 with thick sided case and classic dial layout with black dial and white sub dials. 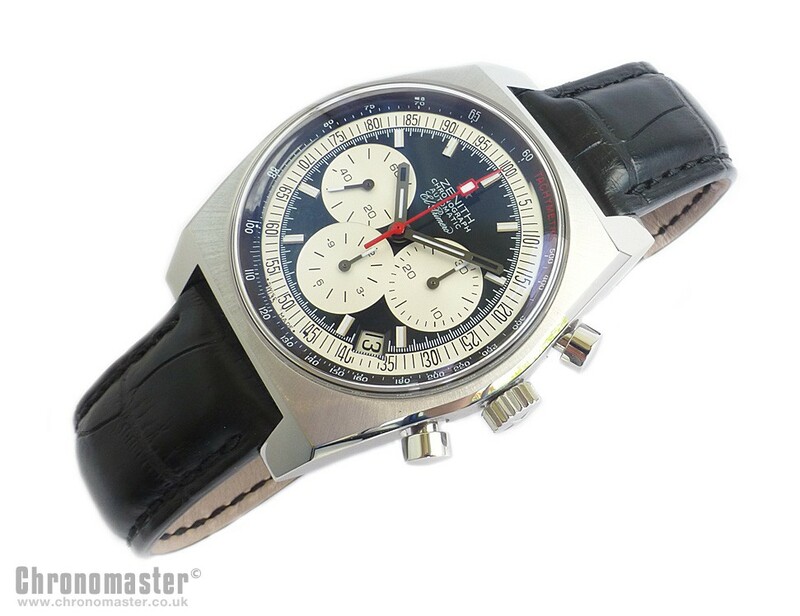 Zenith are a Swiss company steeped in history since 1865, and are a world class organisation producing some of the finest chronometric instruments on the market today. They are innovators and style setters. 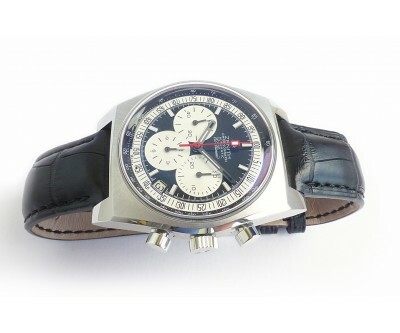 Since the foundation of the company, Zenith have been one of the most prestigious names in fine watch making, combining luxury, craftsmanship and know-how to produce the most perfect timekeeping mechanisms ever. Such a degree of excellence is not solely a matter of technical expertise, it also requires a visionary approach, demanding standards and genuine devotion. 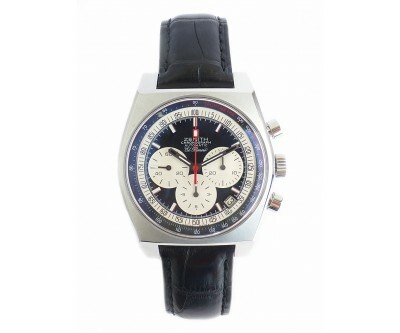 Many of the Zenith chronograph movements – such as the El Primero, has set the world standard in chronographs, and is acclaimed as the international reference for mechanical chronograph movements. The movement in this watch is the peak of technical achievement and a brilliant combination of accomplishment and innovation. 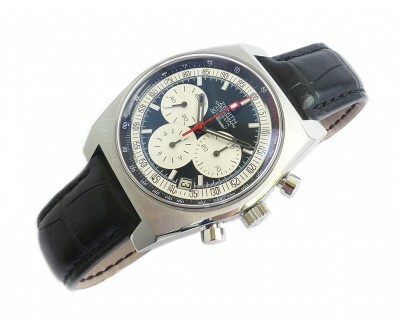 The Zenith movements are distinctive with the integration of component parts achieved after extensive research. This is to produce minimal size and optimise the space available, incorporating complicated technical features, which are robust, accurate and reliable. 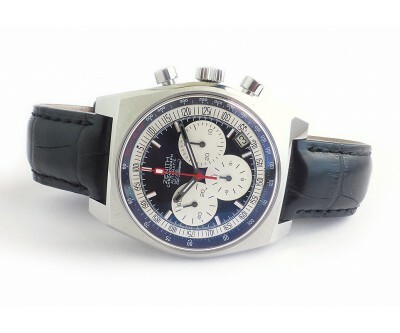 This movement was first introduced in the 1950’s and has been refined ever since to become the leading chronograph movement in the world today. The extreme reliability of the movements is the result of a long quest for perfection covering everything down to the finest detail. 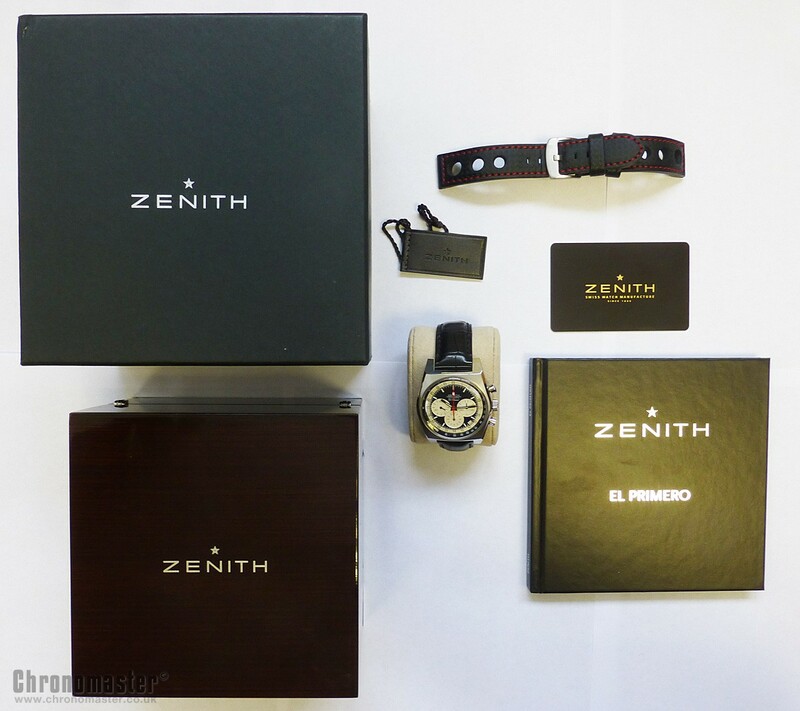 The name Zenith has achieved world wide acclaim in recognition of the elegance and accuracy of the watches and Zenith still aspire to innovate, in the relentless pursuit of technical perfection. Zenith are one of the few companies that can call themselves a manufacturer, as they design, manufacture and assemble all components in their own factories. The Rainbow collection is shaped for exploits beyond the realms of normal endeavour, taking up two demanding challenges – the total accuracy of a complex movement and the endurance required in sport. These peak performance automatic chronographs, standing up to the test of both air and water, are styled for action under extreme conditions. 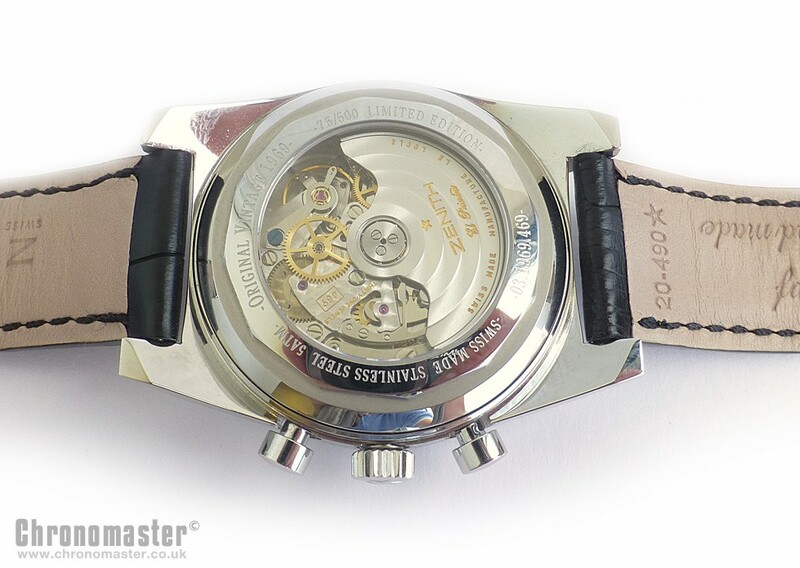 This one is a real beauty, it is of highest grade stainless steel construction, automatic movement, 48 hour power reserve, sapphire crystal, glass display back, white dial, date at 5 position, and it is water resistant to 100 metres. 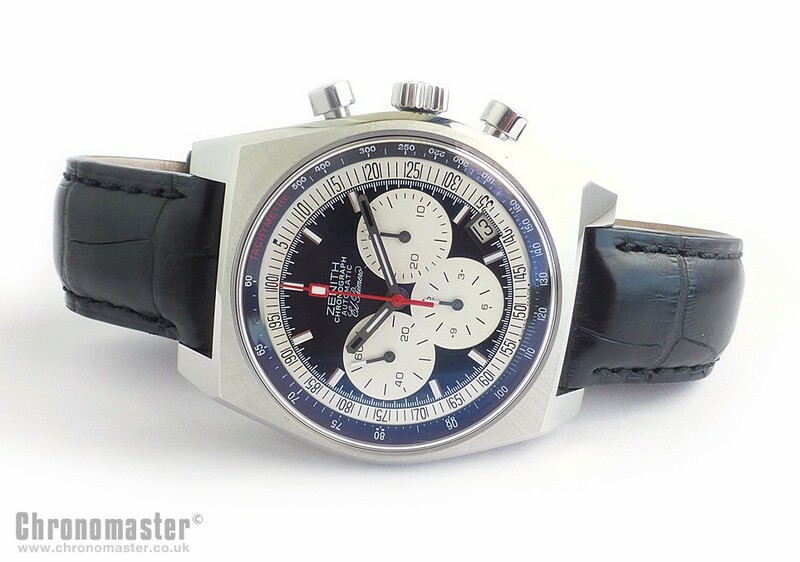 Just about all you could want in a watch. UK retail price was over £5,500. 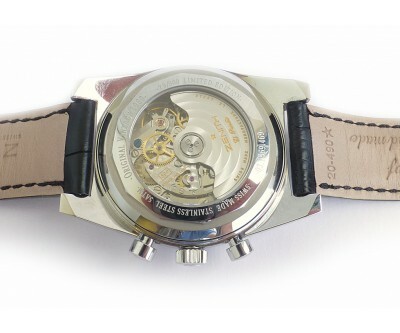 Dimensions are 40 mm excluding crown, 43 mm including crown and 49 mm lug to lug and 15 mm thick.